Have you ever thought about having a different name? Why is your name just right for you? I really liked the way the character in this book took time to think about his name. 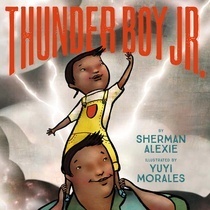 Thunder Boy Jr. was written by Sherman Alexie and illustrated by Yuyi Morales. It was published in 2016 by Little, Brown and Company. There is a strong voice in this book, since it’s written as though the main character is talking to the reader. I really loved all the fun possibilities the main character comes up with for choosing a new name. This is another good example of a story with different layers and an important message about being yourself. This book would a great addition to a classroom and school library collection. Not only does it reflect the perspective from a native American culture, it also shows a strong relationship between a son and his father. I would be so great to read early in the school year when students are getting to know each other and learning about each other’s names. I love the line: “I want a name that sounds like me.” Discussing all the possibilities for a new name would provide lots of opportunities for students to talk about some of their accomplishments and experiences. List at least five experiences you are proud of. What names could you make up for yourself? Choose an important adult in your life. What things do you love about him or her? In what ways do you want to be different? I really have a soft spot for Native American books. This book really empowers! Many children from other cultures struggle with how people pronounce their names. This book would certainly help kids with a better sense of themselves. Great choice. What a fun idea to imagine a new name based on experiences I'm proud of. I'll have to think about this for a while. I'm looking forward to reading this book and learning more about Native American culture. I also noticed a strong resemblance of the author to the father on the front cover of the book. Thank you for a great book review. I love this book and have read it several times. Yuyi Morales is one of my favorite illustrators. Her work is so deeply layered. Great choice! Sherman Alexie is a compelling writer. I didn't know he had written a book for such a young audience. I'll be looking out for it.